We’ve had a lot happen this weekend from all over the Eurovision world, so I’m going to break my Weekend Update up into bite-sized regional chunks. And away we go! The Finnish representative will be ultimately determined on February 12th. As expected, the Icelandic semifinal on Saturday was not only full of talent, but also highly emotional. After the sudden passing of Sigurjón Brink about two weeks ago, there was a bit of doubt whether or not his song “Aftur Heim (Home Again)” would be performed. Not only was it sung on Saturday night by a group of six of his personal friends, but it easily qualified for the final. As in Finland, the Icelandic final will be decided on February 12th. There has been a lot of momentum behind Yohanna, but between Jógvan’s popularity and the sympathy vote behind Sigurjón’s final song, the field is more open than I think people give it credit for. We’ll see in a few weeks! More news to come, of course! Posted on January 31, '11, in 2011, Finland, Iceland, Norway. Bookmark the permalink. 3 Comments. I do not believe popularity brings victory at the national level. Didn't that same Jogvan guy try to win last year. Once I heard Hera's song, I knew she was going to Oslo. That popularity of his brought him only as far as second, without a viable song option.Maybe Magni's song contains more below the surface. I could imagine that song on the Düsseldorf stage, now that I think about it. I think if it goes, though, it has less chance of success than Johanna's song if she went.One would have an amazing story to tell, though, if Brink's friends won it! It would make Eurovision history.You might very well be right about this "more open field than people give credit for". 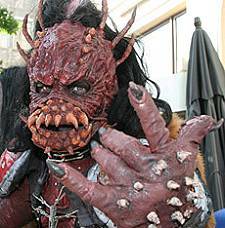 I think Sampsa Astala was more handsome as part of Lordi than as part of Pamela and Co.! More classically handsome, wouldn't you say?